I think if enough people tell MBTA they want like a active system map (Yes, the active system map function is on the bombardier MOVIA which uses LED) they will put it on their new train or maybe even upgrade it for the blue line. I don't really want the MBTA to get the onces that NYC has like the LCD types those cost too much, and properly have higher maintenance cost over LED, if the LED brakes and could replace it with new LED which cost much cheaper. And this would be great for the MBTA that means everyone could see where they are. I predict that these kind of active system map would be on the new Red and Orange line trains. Maybe they might even added it to the blue line if they think it'll work. Not many interior tech are added between the 1800s and 700s, active system map would be a great way to show off the MBTA, so when people in USA think of active system map they'll think of NYC Subway, and the MBTA. I don't get why MBTA didn't do this on their 700s train, this would not add that much of a cost to the 174 Million maybe 1 Million - 2 Million for those system. And maybe for the automatic public announcement system they could also say what is near the stop So it would be like..."Next Stop Government Center, Change here for the Green Line, Exit to City Hall, JRK Building, Faneuil Hall, Quincy Market, Doors are open on your Right" This would be much better telling people where this exit could go too. And i hope that the MBTA install Platform Screen Doors in the Blue Line It would make their newly rebuilt system look top of the line for USA. My Utopia for MBTA would be, the 700s with active system map, finsh rebuilding all the station, install platform screen doors or half height for above ground station like airport. The MBTA right now should do those little change that makes a big different. Telling people what this station has for them would be great so if you want at park street they could tell you that you that boston common is there too.. so it would be like ""Next Stop Park Street, Change here for the Green Line, Exit to Boston Common, State Hous, Doors are open on both side" and could they tell people about how many more min before the next trains come something like the silver line has. So it'll tell you like you can to wait for 7 min to get on a train. You are lucky the current ASAs tell you there is a connection made at stations. If you start mentioning land marks then everyone will want a mention. That's a bad idea. I want to see them add bus routes to the ASAs not just local bus connection. Philly does it and it works well. Bus wouldn't work, what happen if you are in a bus hub, like Malden Center, Quincy Center, there is atleast 10+ bus routes. ASA could be better just sticking with what then have then, but Live Maps would be a great idea for people who comes to Boston and don't know their way around it. And the best place i could think of installing them is just above the doors, how much does those thing cost to install in their newer train like, 1800,700. But is pretty worthless doing it on their old trains. People who visit Boston can pick up a tourist map. If they can't see the gigantic "Park St." smack dab in the corner of The Common than there is little help for them. We don't need to tell everyone in every car of every train about tourist landmarks every time they pass through those stations every day. It would drive them insane. As it is, I've seen tourists completely ignore the ASA announcements and frantically yell to each other "WHERE ARE WE?!?!?!" while the system is blaring station announcement throughout the car. Some people refuse to think, extra handholding isn't going to help. While it would be nice to have something like this on the T, it's not worth the expense of retrofitting it on existing cars with the T in as much debt as it is. It might not even be worthwhile to have that installed in the next order of new cars. Boston is a well known city around the world for its education, you want people to have a good impression on Boston, and if we always stay just with the same thing they'll be out dated, out of sync with other system and the train will keep getting worst if we don't improve it, because tech moves forward, we always stick with the same interior, exterior, cabin tech, station design. We'll be out dated as we stay in the same step and tech moving forward in its way. They need to keep moving on and so i think we'll see them, they are on the new 7000s series train in the D.C metro, and the R142,R160 has them too i don't see why the MBTA would try to isolate them self from other system by not upgrading to better tech, and design. and those are out dated. But the new train MUST have ASA, i don't see why the MBTA would try to move back in time, Live Maps is a maybe depending how much $ they have. Maybe they could sell more Ads right now to get better trains. 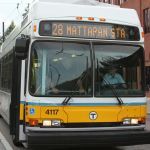 itszjay wrote: So it would be like..."Next Stop Government Center, Change here for the Green Line, Exit to City Hall, JRK Building, Faneuil Hall, Quincy Market, Doors are open on your Right"
I despise riding the 700s because the ASA will not shut up. By the time it finishes the current round of announcements it almost immediately starts on the next one; if I regularly commuted on the blue I think I would go insane. Honestly I think the green line probably has the best ASA system. The guys voice is a pleasant pitch (what idiot came up with the buses voice) and it tells you what you need, without sounding like a travel brochure. As far as live maps, my first time riding NYCs N/W i thought "wow, this is really cool, we should have this in Boston!". Then I noticed it said the destination was Coney Island... I needed to be in Queens. I freaked out as I was already late to meet my friend and almost got off at the next stop to reverse directions, but I was sure in my gut I boarded on the queens-bound side of the platform. Sure enough the map was busted and telling me I was going the wrong way. Needless to say if I was unfamiliar with public transit I probably would have gotten on a train going what the computer told me was the right way, and wound up on the wrong side of the city. My point being when the tech works, its nice to have all those bells and whistles, but they hardly help anyone because if youre a tourist you most likely checked a paper map, and if youre a local you ignore it anyway. However when it breaks it has the potential to REALLY screw people up. At least when our ASA breaks *cough* red line *cough* the operators tend to turn it off or announce over it. I love technology, but the more you put into our trains, the more potential there is for it to break. Always pulling my friends (who are from the NYC area) up to Boston, I get a unique perspective. A close friend and first time visitor to boston noted that the new fairgates are nice, but slower to let people in than an old turnstyle, the automated voice announcements in stations are cool, but the trains take for ever to get there, and the type 8s are fancy and have the ASA, but we were going 5 miles an hour and stopping every couple of feet. The problem with our system isnt how it looks, its how it operates. If the T had invested the money its putting into "station renovations", annoying bilingual automated PSAs, and fairgates into new cars and a signal system that worked, THAT would be impressive. I don't like it when people compare us to New York, but if it wasnt for the clothes people wear you'd think you were still in the 20s with the way their stations look. You dont have much time to look though because an old busted train will soon come to let you on. That busted train however will wisk you 150 blocks in only a few minutes. Look at the silver line and its gorgeous underground stations. if they had put concrete caves in the ground and used that construction money to do something crazy like RAIL, you'd have a great system. instead your standing around in an architectural wonder for a half hour to wait for a BUS that will get you to your destination slower than if you had just walked in the first place. Yea, well the MBTA need to take care of the ASA. But for the ""Next Stop Government Center, Change here for the Green Line, Exit to City Hall, JRK Building, Faneuil Hall, Quincy Market, Doors are open on your Right"" I was reading it out loud as the around the same speed the red line was reading them. it took 13 second to say that and wouldn't be that bad. for example some station has not thing good so they don't need it.. This would be good for the major tourist place. For e.x i live in N. Quincy nothing good is in N. Quincy so they wouldn't need anything. so it would be like "Next Stop North Quincy, Change here for local bus connection, Doors are open on your Left" The Red line ASA mess up way too much. I think ASA are still new to the USA back in the 1993-1994. So they wasn't very good at setting up the system. I never notice the green line mess up before. itszjay wrote: for example some station has not thing good so they don't need it. Your opinion. If there was nothing good there nobody would get off there and there wouldn't be a T stop there. Arborway wrote: People who visit Boston can pick up a tourist map. If they can't see the gigantic "Park St." smack dab in the corner of The Common than there is little help for them. We don't need to tell everyone in every car of every train about tourist landmarks every time they pass through those stations every day. It would drive them insane. While that is a neat little gizmo, if someone can't figure out what station they just left and what direction your heading (aka which stations you are between), then they have other issues. While it would be nice if the MBTA could get every upgrade imaginable for their trains, some things just aren't feasible/practical given the current financial situation of both the MBTA and the country as a whole. That said, I think priority goes to keeping the fleet rolling rather than installing LED's to tell me what 2 stations I'm currently between. Those LED's won't be too useful to anyone if all the trains are sitting in the repair shop. Well, ASA are 100% going to be on all the new MBTA train. Live Map that you might see soon in some train, or they could even upgrade it during mid.life rebuilt. But they should have a better voice. And when to get a prototype for new train put it in a station for a week and ask people how they think, and ask for comment. Then start ordering them. well, I used to like the female voice on the "yellow line" before they changed over to the new monotone voice. I travel every day on the Red Line, the ASA on it some time mess up. I hope during the 1800 Rebuilt coming in the next 5-7 years, they'll fix the problem on the ASA. and when the R160 and R142 stops and when the train departed from the station it sounds nice cool, and modern. Haven't been on the Blue Line much, how does the Blue Line 700s sound when riding on it? Is it loud, bumpy? I remember orange line is always bumpy, and the trains gets shaking alot. Who does the ASA voice anyway, does the MBTA pay lots of $$$ for people to do it? The ASA is software based. It can be fixed at any time if theres someone to do it.